Step off the tube at Ladbroke Grove and just a short 10-minute walk up the road (ample time to enjoy your lunchtime smoothie) lies the modern five-storey building, suitably named ‘Fruit Towers’ – home of everyone’s favourite fruit juice (look away Tropicana execs): Innocent Drinks. On first impressions, sure, it might not quite resemble the HQ of a multi-million pound drinks empire, tucked away in North West London … but its stylish subtlety on the outside, is contrary to the quirky goodness within. Designed by Stiff + Trevillion, and in keeping with the friendly, happy, goodness associated with the Innocent brand, the office features a super green, super economical open communal space, large enough for the whole 200+ staff to get together, turfed with green grass throughout and furnished with picnic benches, booths, table football, a ping pong table, suspended chairs and an archetypal English red telephone box. You would be forgiven for thinking this office space is better suited for an indoor picnic rather than serious business, but don’t be fooled…. Favouring chill-out areas, a roof-top garden and grass-green smoothie vans, the powers-that-be have transformed the playbook of planning and design once associated with corporate success, championing the view that happiness breeds productivity. 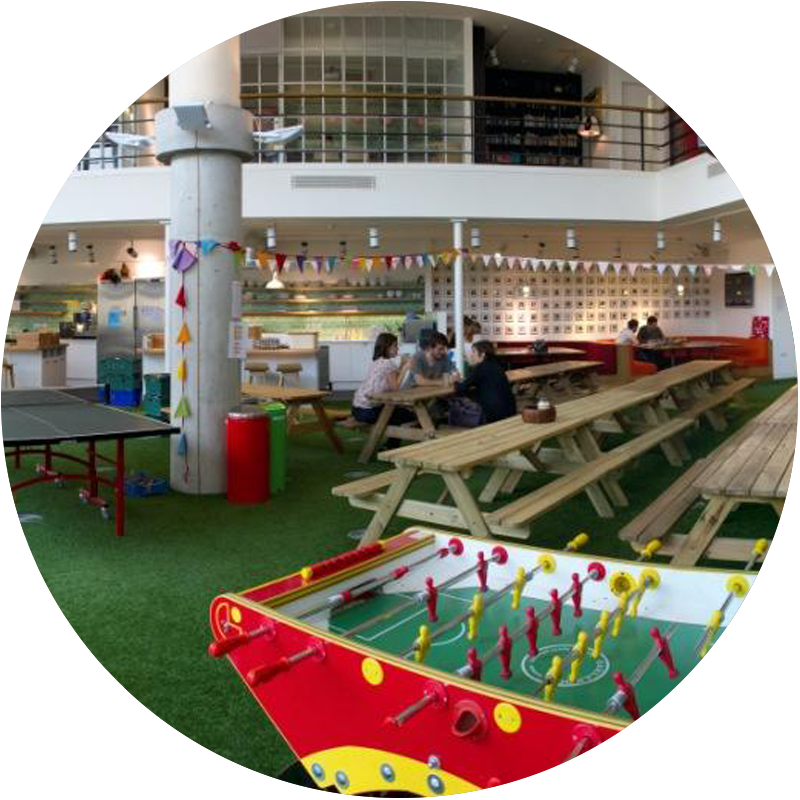 Small homely touches are therefore peppered throughout the workspace, including a wall of staff baby photos, a library, a roof terrace, a retreat area – even a personal gym – with an inviting open plan family kitchen in the centre – the perfect place for employees to conduct their juiciest ‘meet you in the kitchen’ chats. So if you’ve heard great things about Fruit Towers on the grapevine (but have yet to wet your whistle) why not join us on Thursday 16 November (14:30-16:00) to see what all the fuss is about. Come and enjoy a sneak peek tour of a London HQ that is far from innocent when it comes to squeezing the juice out of every opportunity for creativity and fun. 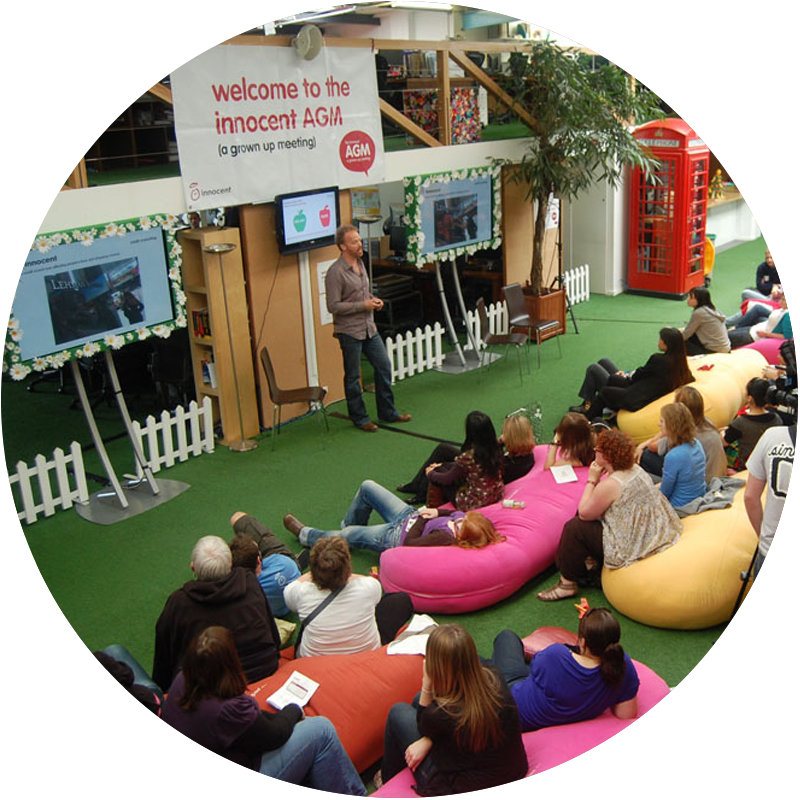 Guilty as charged, Innocent Drinks’ HQ is one Smoothie Criminal.